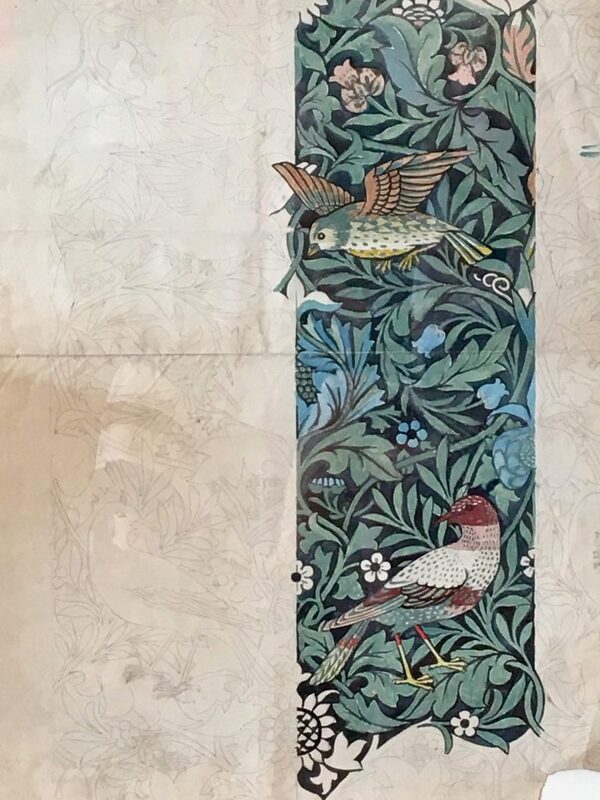 The William Morris Society was founded in 1955 to make the life, work and ideas of Wiliam Morris (1834-96) better known. 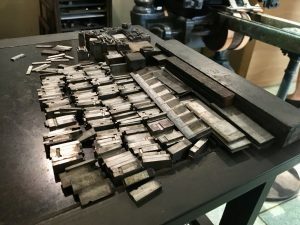 Designer and craftsmen, poet, printer, socialist, novelist, environmentalist and idealist: Morris’s work was influential in his own time and has left a legacy that still resonates strongly today. Kelmscott House is a late Georgian residence, situated on the north bank of the river Thames near Hammersmith Bridge. At 26 Upper Mall, the property was built just prior to 1790, probably on the site of a former warehouse. It originally shared grounds with 22 and 24 Upper Mall that stretched all the way to King Street. No. 24 was rented by Catherine of Braganza for her household when she lived in the adjoining estate and it originally formed one dwelling with no. 22. 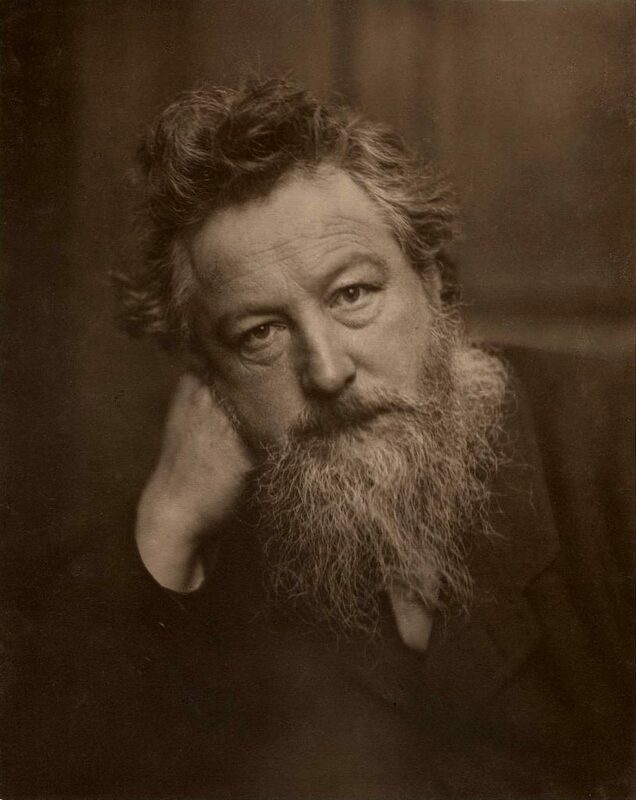 William Morris lived at Kelmscott House from 1878 until his death in 1896 even though he disliked Georgian architecture. He changed the name from The Retreat to one that reflected his happy association with Kelmscott Manor, his summer home in the Cotswolds from 1871. In July 1970 Marion Helena Stephenson bequeathed the house to the William Morris Society. 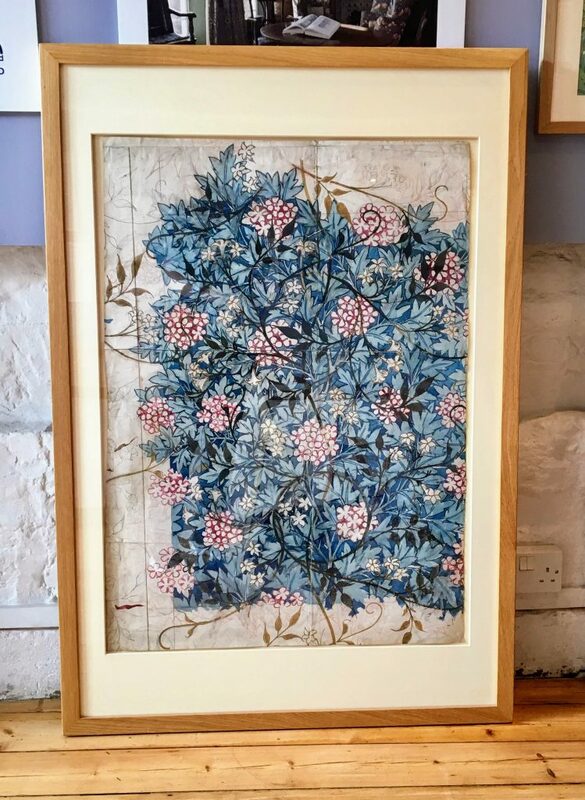 The majority of The William Morris Society’s collection also originates from her generous legacy. Today, the main house is a private family home (leased from the Society), while the basement rooms and the coach house are the Society’s headquarters. 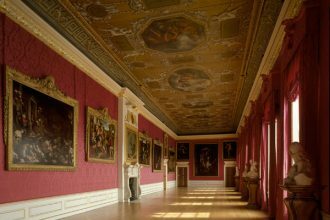 These rooms offer a fascinating glimpse into Morris’s political and creative activities during his final years. 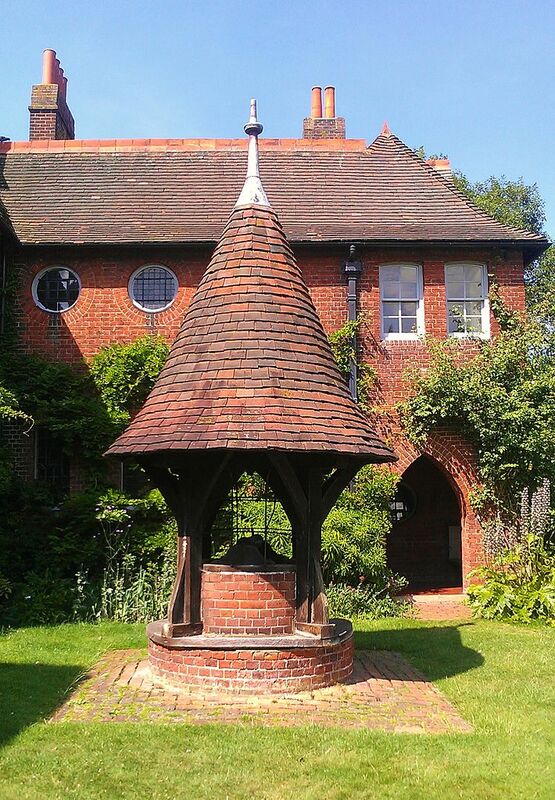 William Morris and Philip Webb built and designed The Red House in Bexleyheath (south London) in 1860 using local materials. It was the only house William Morris owned as all the other places he lived were rented. Along with friends such as Edward Burne Jones, Morris had an antipathy towards the society in which he lived. He was appalled by the perceived ugliness of Victorian society. 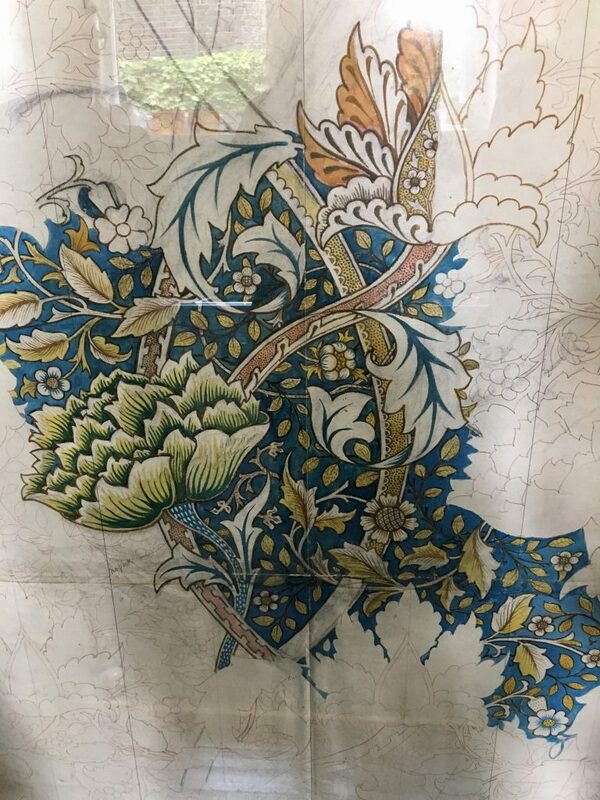 Morris wanted to make beautiful things for others to decorate their homes although, ironically, only the middle classes (often made rich from the mass production factories) could afford his hand-crafted designs. Morris believed in quality products without exploiting those who made them. His workshop at Merton Abbey was built to be a healthier place to work than other Victorian workplaces. Staff worked fewer hours and younger members of staff were given free schooling. 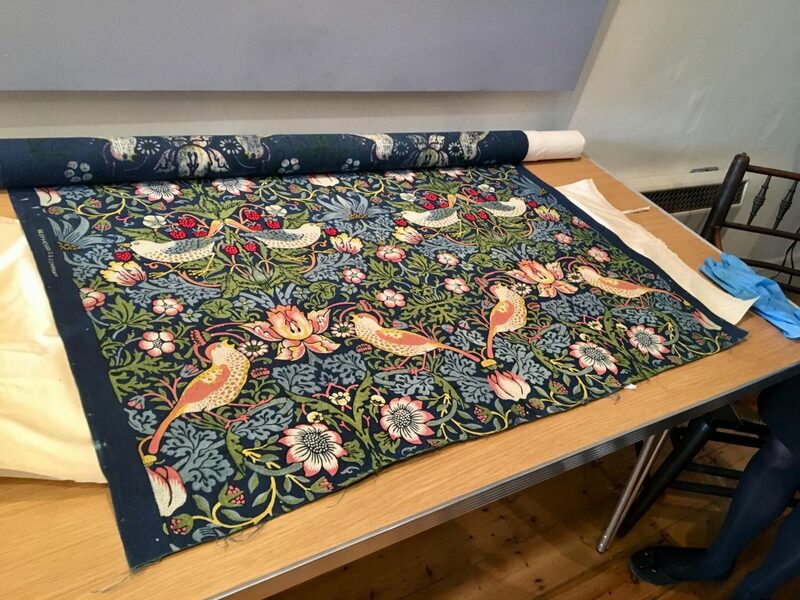 On the ground floor of the coach house at Kelmscott House May Morris, William Morris’s daughter, employed local women to weave her first carpets. They soon became so popular that production was moved to Morris & Co.’s works at Merton Abbey. When Morris became active in politics the ground floor of the coach house became the meeting place for the Hammersmith branch of the Socialist League, attracting notable speakers such as Pyotr Kropotkin (a Russian revolutionary activist), Kier Hardie (the founder of the Labour Party) and George Bernard Shaw (playwright who went on to be close to May Morris). 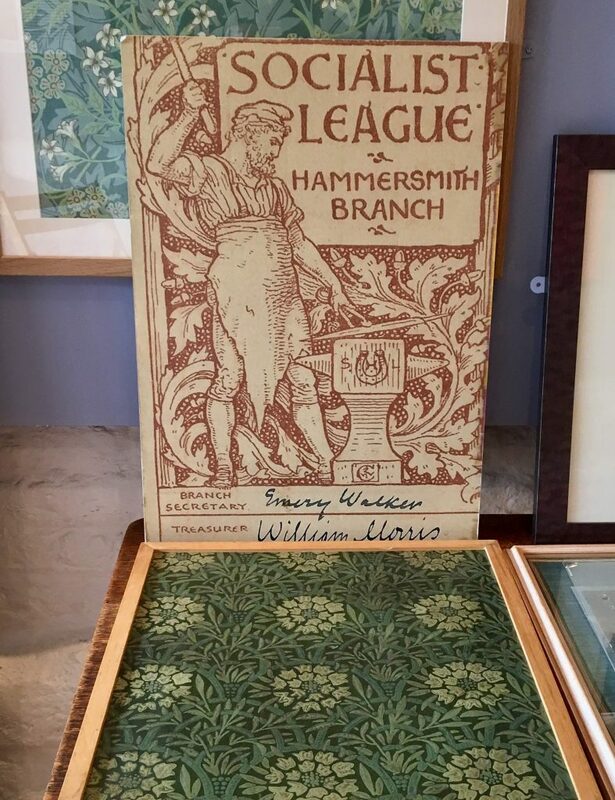 The Branch Secretary was Emery Walker and the Treasurer was William Morris. While he is not such a well-remembered name, Emery Walker was central to the Arts & Crafts movement as he knew all of the artists involved. 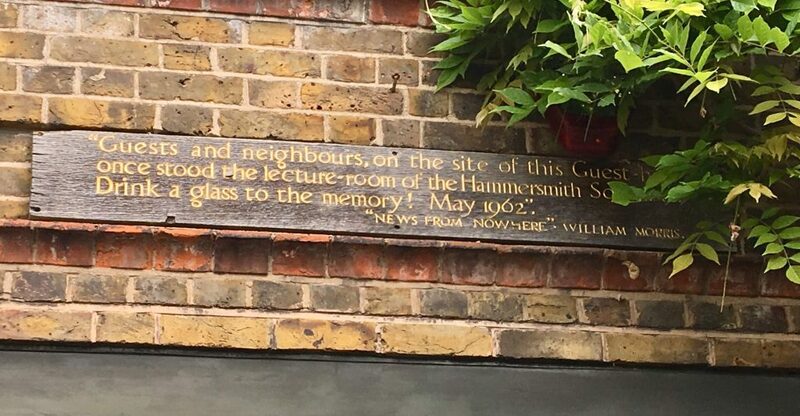 William Morris “did not think the day complete without a sight” of his friend, Emery Walker. 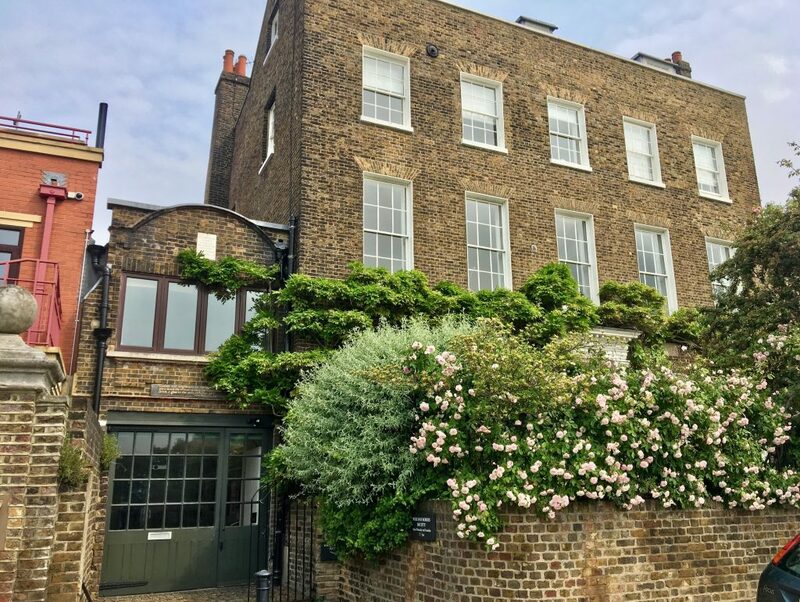 Walker lived ten minutes walk away and you can visit Emery Walker’s House today. Sign above the entrance to the William Morris Society. 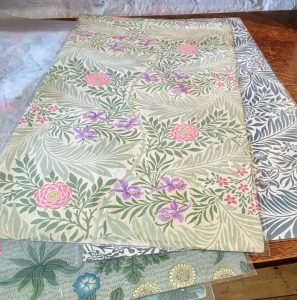 The William Morris Society’s collection includes furniture, Morris & Co. wallpapers, watercolour designs and a variety of textiles. The basement rooms have an extensive Morrisian reference library and showcase changing displays from the collection. 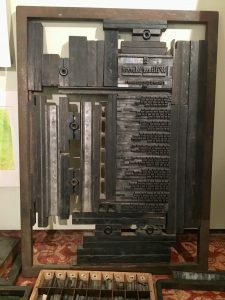 They also house Morris’s 1835 printing press, used in the production of the Kelmscott Press Chaucer, Morris’s last great artistic creation. 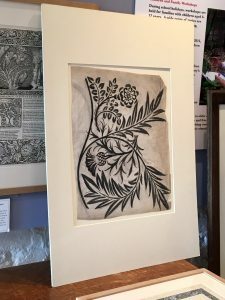 I was lucky enough to get a private visit to the William Morris Society although it is open to the public on Thursdays and Saturdays from 2pm to 5pm. I met with Helen Elletson who is the Curator of the Collection. 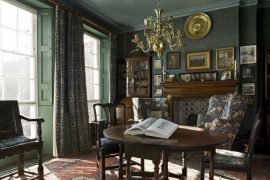 She has worked for the William Morris Society for 18 years and 6 years at Emery Walker’s House. 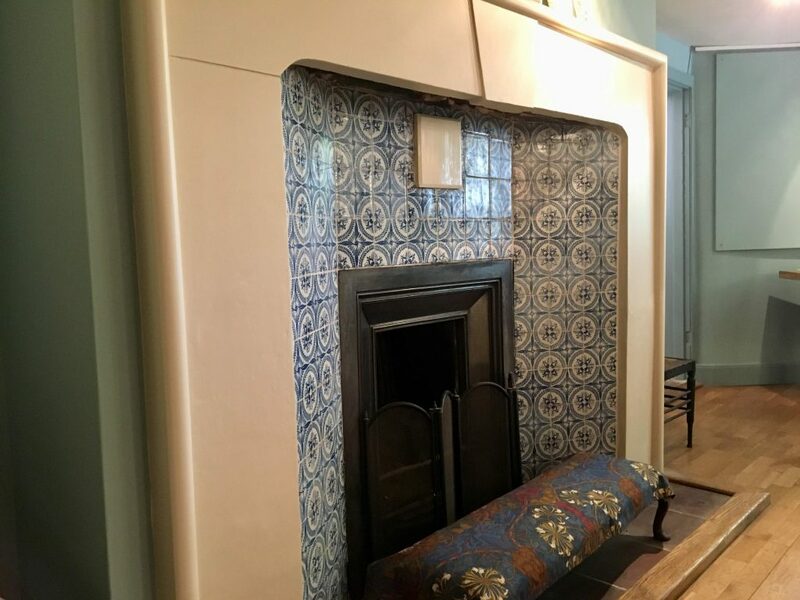 We started in the coach house servant’s hall which has Philip Webb designed tiles in the large fireplace. The original design for ‘Windrush’. 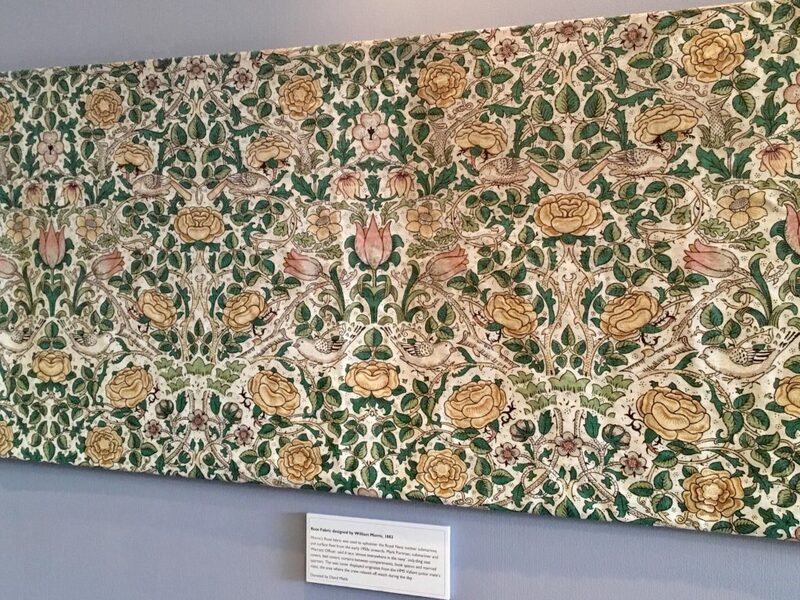 As always, it was well worth reading the captions on the walls as I discovered Morris’s Rose fabric (below) was used to upholster the Royal Navy nuclear submarines and surface fleet from the early 1950s onwards. We got to visit the garden as well and discovered that William Morris gave lectures on garden design. Sir Francis Ronalds (1788-1873), scientist, inventor, electrician and meteorologist, lived at this property earlier in the nineteenth century. 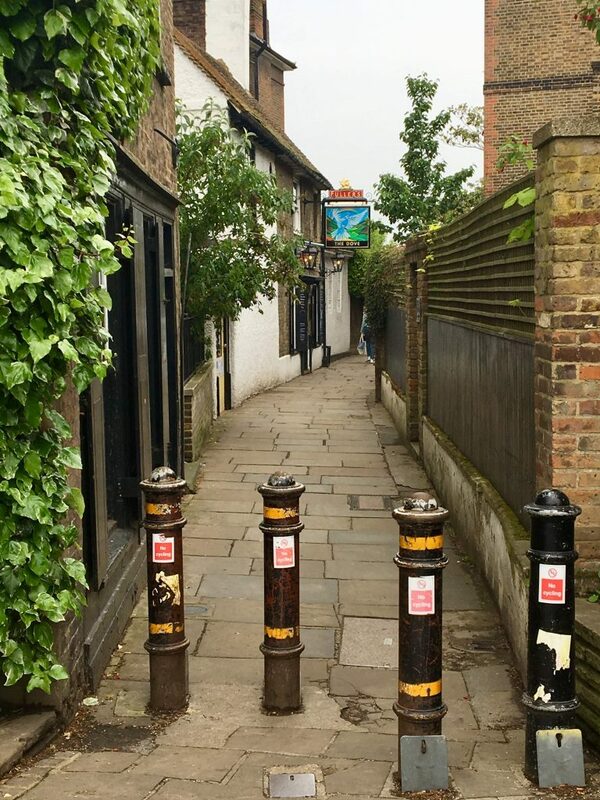 He invented the electric telegraph in 1816 and tested it by wrapping 8 miles of electric telegraph back and forth to the end of the acre-long garden. The garden is now much smaller and there is the constant hum of the traffic on the busy A4 road. With the joy of handmade over throwaway culture, those ideals set out in the Arts & Crafts Movement couldn’t be more relevant today. The William Morris Society Museum was a really enjoyable place to visit. You won’t need long to see the displays but it’s a lovely riverside location and The Dove pub is very close. 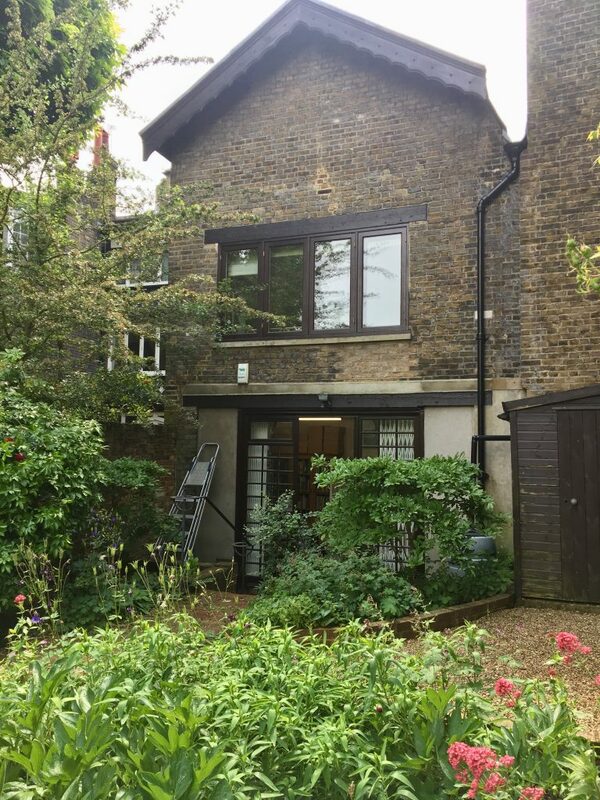 Arts and Crafts Hammersmith is a partnership between The William Morris Society and Emery Walker’s Trust who manage the Emery Walker House. The partnership promotes greater engagement with the lives and works of these two great Victorians. 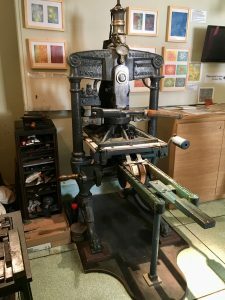 Guided tours, craft workshops and access to the Society’s library and archive can all be booked through the website. There are architectural tours and textile tours available too. If you can’t get there, do see the virtual tour on their website.